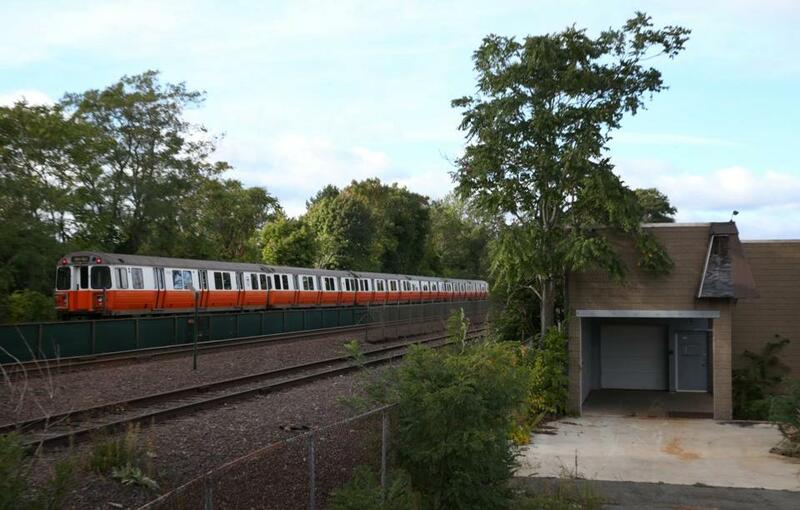 The state is proposing an Orange Line stop on Commercial Street in Malden. Above: A train passes by the proposed station site. State transportation officials hope to build another Orange Line station in Malden and extend Silver Line bus service into Everett as part of a long-term transit plan spurred by a forthcoming $2.1 billion resort casino along the Mystic River. As Everett and surrounding cities prepare for the 2019 opening of the Wynn Resorts casino, the Massachusetts Department of Transportation has crafted an ambitious blueprint for the area, highlighted by a new Orange Line station between the Wellington and Malden Center stops. The plans must clear numerous hurdles, officials say. A new Orange Line station would take at least seven years and in all likelihood would only be possible if private development contributed a substantial amount toward the cost, estimated at $85 million to $95 million. ■ Bus-only lanes during peak hours on Broadway in Everett from Sweetser Circle to Glendale Square, a $1 million project that would convert parking spots into an extra traffic lane a few hours every day. Signals could also give buses priority over regular traffic on congested streets. ■ A $30 million extension of Silver Line bus service through Everett to Malden Center. It could follow Second Street, Broadway, Ferry, and Centre streets. ■ A $7 million to $9 million pedestrian foot bridge over the Malden River between Malden and Medford to give Everett residents better access to a new Orange Line station. ■ A $4 million to $5 million extension of the Northern Strand Community Trail from its current terminus in Everett to a park near Gateway Center in Everett, closer to the casino. River’s Edge station would be located between the Wellington and Malden Center stops. 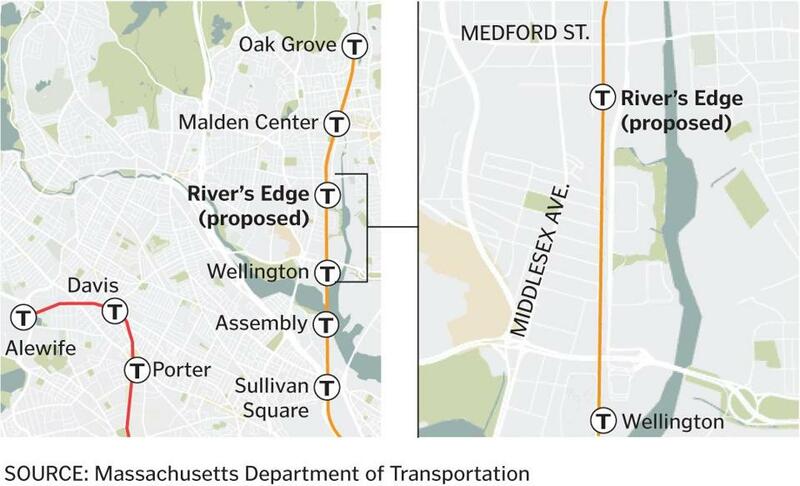 The Orange Line station, informally called “River’s Edge,” could be built along existing tracks across from Malden’s Public Works Department, officials said. The station would provide between 6,000 and 8,000 subway rides a day, officials estimated. Slesinger said the state would look to team up with developers to push the project forward. The River’s Edge housing development is nearby, as is land owned by Combined Properties, a Malden real estate developer. The plan, which is in its early stages, comes at a time when Massachusetts Bay Transportation Authority officials have made it clear improvements to existing service should take priority over expansion efforts. “At this time, there is no capital funding set aside for long-term concepts like a new Orange Line station or Silver Line extension,” Joe Pesaturo, an MBTA spokesman, wrote in an e-mail. Still, Malden officials are optimistic about the possibility. Robert DeSalvio, the president of Wynn Boston Harbor, said in a statement that the company will be an “active participant” in transportation plans for the area. He did not say whether the company, which has agreed to spend several million dollars to run more Orange Line trains, will also help pay for a new MBTA station. John Preotle, the partner of the company that helped develop the River’s Edge apartment complex and property, said he welcomes more public transit but would have to weigh its benefits before committing money to the project. An apartment building on the property runs shuttles to nearby Wellington Station. Plans to extend the Silver Line into Everett would also require substantial planning and community support. The MBTA hasn’t finished extending Silver Line bus service from East Boston into Chelsea, and state officials estimate it would cost $30 million to bring the line into Everett and Malden Center. Everett Mayor Carlo DeMaria said he’s focused on short-term plans to improve bus service, which provides nearly 19,000 rides a day in his city. But more buses are needed, he said. Slesinger said that adding bus-only lanes in the city, along with express buses into Boston, could be a game-changer, one that could happen within a year.